Description: IC 2707 and IC 1024 lead train 385 westbound toward Detroit, with three brand new Norfolk Southern locomotives in tow (numbers 1037, 1040 and 1039). Description: NS 573 with an NS SD70ACe and KCSM AC44CW cross the Shermans Creek trestle. Description: New pair of SD70ACe's on an Illinois bound train. Description: The town of South Fork is now quiet and the sighting of a engine is on the east leg of the wye. Description: NS Coal Train 718 passing through Trussville, Al on its way to Norris Yard. Description: NS 718 heading to Irondale AL & to Purvis, MS with 2 new NS SD70ACes & UP AC4400CW. Description: NS Southbound Coal Train 718 passing through Control Point Watts Jct. in Irondale, Al. 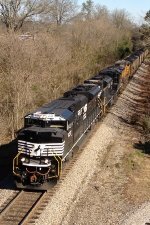 Description: NS Southbound Coal Train 718 stopped in the siding at Trussville, Al. for a meet with 16T before proceeding on south to Norris Yard in Irondale, Al. Description: Following a wind-related derailment last year that sent containers into the Susquehanna River, NS now stores loaded coal cars on the Rockville Bridge during particularly rainy days. This string of cars has an SD70ACe attached to it as well. Description: The effects of motion blur are always interesting. Description: NS 65R Charges West Thru Columbia with Tyhe Central Of georgia Heritage unit in the lead!! Description: NS 65R Blasts under the caternary poles in Bainbridge as uit heads up the Royalton Branch to Harrisburg and points west! Title: 65R Wb @ Rockville! Description: NS 65R, With the Central of Georgia Heritage unit in command, hustles west across the Famous 48-Arch Rockville bridge in the days last daylight!! Description: Heading north to be loaded. Description: God blessed me with some beautiful birthday weather. An EMD trio leads train 11R through South Thomasville on their way to Linwood. Description: With the winter sun setting fast, CN tanker train rumbles east past the Dorval Station. Big treat was the Norfolk Southern SD70ACe trailing unit. Description: A CN C44-9W and NS SD70ACe sit in Champaign Terminal.